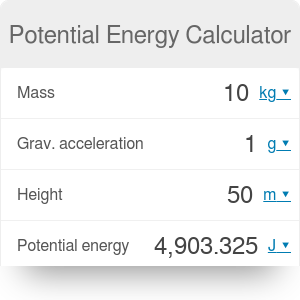 Potential energy calculator enables you to calculate the stored energy of an elevated object. The full name is gravitational potential energy because it relates to the energy which is stored as the result of vertical position or height of an object. Then the calculator will give you the result in joules. If you want to calculate the energy of an object which is in motion, our kinetic energy calculator is highly recommended. Potential Energy Calculator can be embedded on your website to enrich the content you wrote and make it easier for your visitors to understand your message.